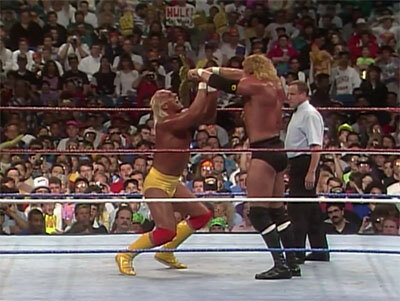 INDUCTION: Hulk Hogan vs. Sid Justice at WrestleMania VIII - Who Wanted That Silly Hogan vs. Flair Dream Match Anyway? - WrestleCrap - The Very Worst of Pro Wrestling! Before I even start today, yes – I’ve heard all the reasons. Or as I like to call them, “excuses”. I know the backstory of why we got Hulk Hogan vs. Sid Justice instead of Hulk Hogan vs. Ric Flair as a main event at WrestleMania. I know why we did NOT get the match that so many of us wanted. And you know what? I don’t care. It’s a bunch of crap. I don’t care that Hogan vs. Flair didn’t draw well on a largely unadvertised house show run. I don’t care there was no good finish available for such a match as Hogan was leaving and Flair was staying. I don’t care that there were logical, thought out reasons for why we didn’t get it. And the saddest part of all? It was in my hometown, so I was going to get to see it! WCW figured it out. Why didn’t Vince? And the stupidest thing, the most maddening part of all this, is that fans were told they were getting Hogan vs. Flair at WrestleMania! If y’all thought Vince only recently started trolling his fanbase, well, this induction will educate you that it’s been going on far longer than any of us would like to admit. So the fun all started at the legendary 1992 Royal Rumble, arguably the greatest match in WWF history. Ric Flair went nearly bell to bell and won the held up WWF title by last eliminating Sid with the help of Hulk Hogan, who appeared to be the biggest cry baby ever yanking the big over the top rope after he’d already been eliminated. Seriously, I have zero idea what they were thinking there, as they definitely wanted Hogan to be portrayed as the hero (as is evidenced since they piped in cheers to mask the loud boos in subsequent airings of the match ending). The crazy thing is all these years later, I’ve still never heard a valid explanation of that match’s ending. Regardless, that leaves us with Ric Flair needing to defend his title at WrestleMania. The question: who should be his challenger? I mean, obviously it should be Hogan, but let’s build some intrigue! 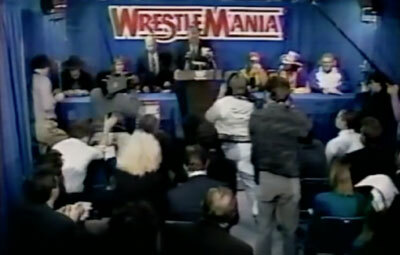 So we get a press conference overseen by the greatest inept authority figure in pro wrestling history, Jack Tunney. He introduces us to the potential challengers: Roddy Piper, The Undertaker, Sid, Randy Savage, and of course Hogan. One of the reasons I always loved that 1992 Rumble is because it featured so many huge stars during the WWF’s glory period. This little clip here almost brings chills – that is a murder’s row of big names to be sure. Really, was this that hard? You want to maximize pay-per-view buys (back when this really did matter! ), you’d make it Hogan versus Flair. 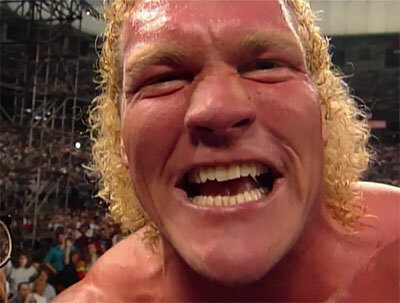 The other potential challengers weren’t thrilled, but there was one guy far more upset than the rest: big ol’ Sid. Why he was so furious he couldn’t even tear up whatever papers he had in his hands! That there is a POUTY FACE. Pretty sure RD Jr walked around with a full diaper as a baby and never looked that upset. As much as I think switching the main event was an idiotic idea, I have to say that Sid’s frown might just make up for it. To all those people who over the years asked why Sid would always get chance after chance after he’d vanish for whatever reasons (often times to play softball, no joke), just look at that face. Sure, the dialogue was fine (the dual highlights of which is him claiming that he didn’t get the title shot because he wasn’t a big movie star like Hogan and that Jack Tunney was, and I am quoting here, BOGUS!!!! ), but you could put Rhapsody in Blue in the background and odd are there are still folks who’d want to see him pummel somebody. But hey, who cares about Sid? Especially since we got the dream match announced, complete with graphic and everything! Imagine young RD, ticket in hand, salivating at what the Apter mags had been teasing for years: the battle of the biggest champions in pro wresting finally colliding! Immediately after this announcement, we got one more show, a Saturday Night’s Main Event, wherein Hogan and Sid were to be tag partners. And yeah, we know how that turned out. Sid turns on Hogan (look at the chump crying in the background!) and suddenly, that Hogan vs. Flair match begins to vanish before our very eyes. On the plus side, we did get a great segment with Sid destroying Hogan’s buddy Brutus Beefcake’s Barber Shop. While some would note that Sid threatening to rearrange Beefcake’s recently reconstructed face was the highlight (this would be after the guy had that horrible parasailing accident so it was pretty heinous), I respectfully disagree. No, that would be Sid smashing things into oblivion, and in the process, getting himself completely covered in talcum powder. That’s somehow a really Sid thing to do. And again, just imagine Rhapsody in Blue in the background. You’d still want to pay to see the guy, right? I mean, I would too – just not against Hogan at a WrestleMania when we could have gotten the first ever PPV match versus Flair. We don’t even get Tunney announcing the change to the main event himself! No, it’s Lord Alfred reading a letter Tunney has written about the situation. Wait, did he mail this to Alfred? Did he fax it? Was faxing even a thing in 1992? Seriously, this is the WRESTLEMANIA MAIN EVENT. What on earth was Tunney doing that was so important he couldn’t make time to come to announce this himself? Or was he just wanting to stay out of the public eye due to so many people being ticked off about the change? In order to attempt to salvage things, we got a bogus “will this be Hulk Hogan’s last match ever?” storyline. What made this even more insulting is that Hogan never said he was retiring, it was just hinted at here and there, with something of a nod and wink. No one with any brain would have really thought Hogan was leaving. Of course, no one with a brain would have changed the main event either, but whatever. Which leads us to the match itself. And let me tell you, this may be the worst WrestleMania main event of all time. As I sit here and think back, I remember folks thinking Hogan vs. Bundy at Mania 2 was bad…that thing is a ***** Dave Meltzer certified classic compared to this. On the plus side, the match does start with both guys attacking each other before the bell. I remember a Randy Orton-Triple H Mania match that was built up for months, a real blood feud, and it started with them locking up in the middle of the ring. So Hogan and Sid did better than them for like thirty seconds at least. From there we get a thrilling test of strength. Now look, I know that was a Hogan staple and we saw it all the time. But this one lasts, no joke, THREE MINUTES. Hogan goes down, starts to come back up, then goes down, then comes back up. Then Sid knees him in the stomach. Then he hits a kinda sorta choke slam as Hogan lies on the mat for another couple of minutes. Sid eventually gets so tired of beating Hogan down he just goes over to the corner and cuts a promo. And it’s a pretty dang terrible promo. Sid has a history of doing promos. Sometimes they’re good. Sometimes they’re bad. Sometimes they are both, like that hilarious promo where he claimed that he (Sid) had half the brain of Kevin Nash. Or the time when he started a live promo, and asked Jim Ross if he could start over. This? This was just a bad promo that made no sense, which you can listen to here. Seriously, this is WRESTLEMANIA. THE MAIN EVENT. Cut a promo if you want, big guy, but make it a great one or a horrible one, dude! Just when you think things can’t get any more thrilling, well, they don’t. Instead Sid hits Hogan in the back with a doctor’s bag. Yes, like the one a doctor from 1940 would carry a stethoscope around in. As a reminder, this is a WrestleMania main event. Trust me, I had to keep telling myself that as I sat in the Hoosier Dome that night. Next we get Sid appearing to gentle massage the Hulkster’s left shoulder. My neck has been hurting a bit lately, I wonder what Sid would charge to give it a tune up. Even Hogan looks like he’s falling asleep! There have only been maybe four moves in this match, but it feels like it’s hitting the 25 minute mark already. Can this thing just end? Sid hits a really jankity looking power bomb, and of course Hogan kicks out and starts Hulking up. Same drill we’ve all seen a hundred times. But that’s when everything starts going awry with folks missing time cues left and right. So Hogan starts pummeling the big guy, then hits the leg drop. After a count of two, Sid kicks out and Harvey Wippleman comes into the ring and the ref calls for the bell. Umm, what? According to various sources, Papa Shango was to interfere prior to the three count. That didn’t happen. And for the record, this was the first time someone kicked out of the vaunted leg drop during this Hogan run in the WWF. That should have been HUGE. Instead, everyone just looked at each other in a confused manner. Eventually, Papa Shango does make his way down to the ring and he joins in to beat Hogan to a pulp. Gorilla explains that Hogan has won the match by DQ due to Papa Shango’s interference. Not sure how that was possible since Shango showed up a good minute and a half after the bell rang, but this is also the guy who told us people were “literally hanging from the rafters” in a half-filled Boston Garden for years on end so who am I to judge? The rest as we know is history – the Ultimate Warrior (or Kerry Von Erich dressed as the Warrior as folks would tell you at the time!) shows up and saves the day. I won’t lie – I was there, and we all thought that was cool. But you know what would have been even cooler? With that, I want to thank everyone for supporting WrestleCrap for so long, as this past Monday marks nineteen years (!!!!!!) since the launch of this here site! If you have enjoyed what we have done, might you consider donating to our Patreon? It helps us to pay the bills, and you also get cool goodies like exclusive inductions and The RD & Blade Show. You can do so by clicking here. Thanks! 35 Responses to "INDUCTION: Hulk Hogan vs. Sid Justice at WrestleMania VIII – Who Wanted That Silly Hogan vs. Flair Dream Match Anyway?" The other rumor surrounding Mania 8 was that Undertaker would have faced Sid…and lost. Of course, that would mean the Streak never would have happened. More importantly, it might have meant Sid and Taker would never have fought five years later at Mania 13…and Sid would not have (allegedly) crapped his pants. Of course, like RD hinted at above, it looks like Sid did just that at the press conference! I think Flair winning would have been a perfectly reasonable outcome being as Hogan ended up taking time off due to the brewing steroid scandal; even ignoring the fact that Hogan was at the point where loosing the occasional match wouldn’t have hurt his drawing power, having Flair as champion until later in the year and then dropping it would have made that title change feel better (I’m not a fan of short world title runs so Flair dropping it to Savage at WM8 and then getting it back before loosing it to Bret seemed questionable to me). So you blame Flair because you want to blame Flair, basically? This was about the time it finally dawned on me that even though he was traditionally cheered for his actions, Hogan was almost always the heel in his feuds. Being such a sore loser at the Rumble made no sense for the person presented as the face in the feud. RD, were you the guy maybe four or five rows back who kept cheering the heels all night? Be honest. Not a fan of Tuesday Night Assassination either huh? Back when the MSG Channel used to air wrestling at the Garden live, I actually saw a Hogan-Flair “houseshow” match. It was actually pretty good & had a “Dusty-type” finish. Mr. Perfect, who was in Flair’s corner distracted the referee while Flair used a pair of brass knuckles to KO Hogan & actually PIN him 1-2-3 in the middle of the ring! Flair was announced as the winner…until a second ref ran to the ring, “explaining” to the first ref what happened. After searching Flair, they found the brass ‘nucks and reversed the decision, disqualifying him & declaring Hogan the winner. Then the Hulkster cleared the ring & did his trademark posing. Why they couldn’t do something like that at WM, we’ll never truly know. I saw that match on MSG, too. And I was surprised that it was a house show, even though it was at the Mecca of the WWF. And that ending would have been – sorry for the pun – perfect. Hogan wins, Flair retains, posing all around. I’m still mad about this too, RD. I’ve never bought the “house shows weren’t selling” line. The business was on its way down at that point. Some random, unadvertised matches — even this one — weren’t going to suddenly make it 1987 again. They should have went through with the match. And as for the finish? Well, if Hulk was leaving town to hide from the steroid whispers he should have done the job for Slick Ric, who was sticking around. That was your finish. Flair beats Hogan clean. Hulk goes away to lick his wounds and return some day. Hell, you could have still had the Warrior run-in to send the fans happy. A poor choice by Vince. Honestly, the part that most gets me is that the Wrestlemania main event was going to hinge on Papa Shango, who had been on TV for two months – and the Warrior spells happened something like six weeks later so that wasn’t even the driving force. Thanks for calling it the Hoosier Done. I hate those corporate names on stadiums and arenas! And can anyone please explain Sid’s neck hold to me? I’ve seen it since I was little and still can’t understand it! I also remember being confused as to why they didn’t go with Hogan/Flair at WM, though I was excited that Savage got the shot in place of Hulk. I assumed years later that either they couldn’t decide how to have a clean winner while the other kept his heat, or that they were giving the dream match away too soon (like WCW did) and wanted to wait another year for WM 9, but Flair was gone by then, so it never happened. On the plus side, Flair/Savage was definitely better technically than Flair/Hogan would have been. But yes, they really ought to have cashed in on the hype. As you said, it’s one of the few times WCW got something right that WWE got badly wrong. 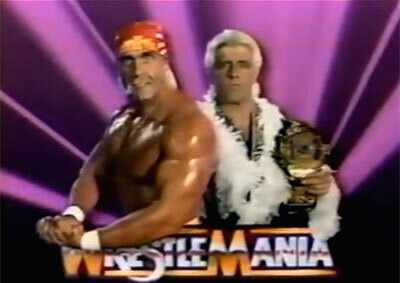 You know, I really wonder if fans would’ve been happier if Hogan wrestled Flair at WrestleMania VIII. For one thing, by 1992 people were sick of Hogan. Just because Hogan and Flair were finally in the same promotion, it wouldn’t have changed the fact that the match would not have been that great. Plus, we would’ve lost Flair vs. Savage, which was incredible. Plus, if Hogan didn’t leave after WrestleMania, it would’ve really screwed up SummerSlam later that tear. Bret vs. Davey Boy as the last match was great. I doubt they would have gone on last if Hogan was still wrestling. Maybe this question can’t be answered, but one of the popular explanations for why Hogan left after this WrestleMania was because of the mounting pressure from the steroid scandal, George Zahorian, etc. If Hogan had stayed visible on American television, would it really have had any impact on Vince’s trial in 1994? The charges were mainly against Vince, as Hogan had been offered immunity in exchange for testimony. Would he have gotten immunity from prosecution if he continued to profit off of his steroid enhanced look on national television? I don’t know. Hindsight is 20/20, but they didn’t know at the time how things would turn out. Things could’ve been a lot worse than they ended up being. If they did Flair-Hogan than we never would have got the Elizabeth pinup storyline and the tremendous no staples here line. What would have been fun was the buildup for Wrestlemania 9 instead with The Nature Boy in Las Vegas cutting promos out on The Strip. It could have been made with such a big fight feel to it considering all the huge boxing events that have emanated from there. Also it would have spared the world from the horrible tag title match with about to be Hall of Famer, Brutus “The F’ing Barber” Beefcake, sidebar does this mean The Young Stallions get in next year with Sivi Afi? I keep hearing people cite the poor house show business for Flair-Hogan but seriously, why the hell wasn’t it being saved for the big show anyways? Like Larry, we got MSG in upstate NY (Buffalo) and I remember watching it and, even as a kid, wondering why it wasn’t being held back. Add to that Vince was having Flair wrestle jobbers on the syndicated shows and you can see why there wasn’t the buzz for this match that there should have been. As RD pointed out, it was one of the few times where WCW had a lot more common sense than New York. 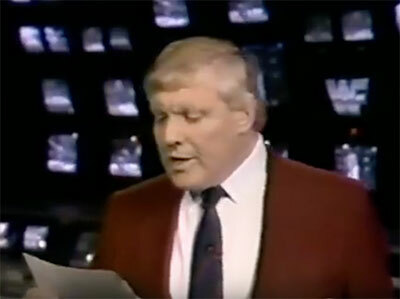 I loved the press conference, from Sid confidently fanning himself with those papers before Jack Tunney made the announcement, to him nearly ripping up the same papers right afterwards and then yelling BOGUS after it was over. In all fairness, Flair vs Savage was WAYYY betted than Hogan vs Flair would have been. They did Hogan vs Flair in WCW and it was dull as crap. Which I would expect given from a pair of formulaic, past-their-prime old-timers who would do anything to keep their spot. I see a lot of “why?”. Why didnt they go with Hogan-Flair? Seems simple enough. I honestly believe Vince underestimated Ric Flair’s value. Sure….he knew he was the top guy in the NWA. He would be striking a huge blow by acquiring Flair but mainly getting him to bring along the big gold belt to embarrass the rival promotion. Vince knew enough to have Flair make waves from day one, kinda hard not to, and to put the belt on him rather quickly. But he did it through screwjob finishes with Hogan and Undertaker and having Flair win it in the Rumble instead of outright beating the champ. Hogan and Flair was the most logical choice but storyline wise, Sid probably deserved the title shot more. Here’s my theory. Jim Herd had just “resigned” from WCW. The company is running on fumes and only Ted Turner’s money is keeping them afloat. Vince wants to put the final nail in WCW’s coffin. To do that, he needs to attract WCW’s die hard fan base. And to do that he needs Flair to be champion. But, Vince can’t count on Hogan to take a clean loss to Flair. So, he decides to change things up because Hogan can’t be trusted. SID! When I was watching this with my father, he had an absolute field day with Sid’s reaction to not being selected. First, my dad said, awwww he can’t even rip up some papers that big man! Secondly, bizzarely, he characterized “bogus” as being something a rich kid would day and therefore thought that Sid was being hoity toity. My old man had a way of really adding a level of intrigue to the proceedings! The best part of the SNME match was Heenan’s comment about Sid and Beefcake’s showdown being a “faceoff”. For the record, Warrior kicked out of the Hogan leg drop at WM6 in 1990. Correction. Warrior moved, Hogan missed the leg drop, Warrior did his splash and got the 1-2-3. Meh I didn’t think Hogan vs. Sid was *that* bad. It wasn’t great,, but it was kept simple, and the Warrior saving the day was awesome! Yeah, I’ll never understand why Hogan was always booked to be such a sore loser. Maybe those instances always looked like he was the hero on paper??? Even as a massive, die hard Hulkamaniac, I especially hated how they didn’t have him get eliminated at the first World War 3 event. Good entry, but I couldn’t help noticing that there was no mention of Flair going on to fight Savage at this WrestleMania … I mean, I know this is for fun and not meant to be an encyclopedic in-depth review of the card, but (if someone without prior knowledge of the show was reading) it kinds seems like Flair and the WWF championship just fall off the face of the earth once the match is changed. This was a memorable match for me, as my family watched on PPV. It was memorable for me for a reason I have never heard anyone else ever mention… It was the moment that totally destroyed kayfabe for me. Why? 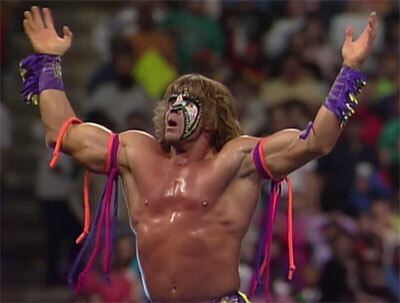 Because the Ultimate Warrior’s music played for his run in. As far as I recall, that had never happened before. Nowadays, a wrestler’s music plays for every interruption, every run in, etc. But that hadn’t happened before this. And in my mind, the production crew could only play someone’s music if their appearance was planned. Warrior had been gone for months… how on earth did his music play when he made his surprise run in to save Hogan? I had to rationalize it as some guy at the entrance curtain seeing him run out and quickly finding the track (which would have been a tape in 1992). As I said, it was the first absolutely indefensible breaking of kayfabe by the company. Not Hogan’s hulk ups, not arm twists seemingly doing no damage to the arm, but this. 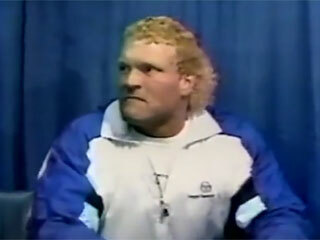 Maybe I’m in the minority but when Tunney announced Hogan was getting ANOTHER title shot, 12 year old me was pissed. I was sick of Hogan by that point. Savage/Flair was far better IMO. And yet nobody calls Savage the biggest crybaby ever, as he was so upset three years earlier when Hogan eliminated him that he stormed back into the ring, held up the match, and practically came to blows with his partner over it. Why do people conveniently forge this? My theory is because the Hogan-haters prefer to stick to their narrative that Hogan is ALWAYS at fault, no matter what. On a related note, how weird was it to see Hogan and Savage side-by-side again at that press conference? the reason hogan vs flair didnt happen at WM8 was due to vince getting booked into a corner and trying to figure a way out of it. remember this is 1992, before HHH, miz and brock winning at mania. in 1992, mania couldnt end with ric flair, a heel winning. on the flip side, hogan wasnt retiring but taking an extended hiatus. thus he couldnt win the wwf title and be off tv forever (way before part time champs). the excuse the match wasnt a draw falls flat considering when hogan went to wcw. the hogan/flair match set all kind of records at the time.